You might ask how to connect iPad to wireless network if you are new to iPad, and the good news is it’s pretty easy task and similar to how to do it on iPhone. Once you have successfully connected iPad to public wireless network at restaurant, cafe, library, airport or other locations, you will then be able to use it connecting to your favorite websites (Facebook, Twitter, YouTube, etc), do online chatting, email checking or perform other Internet access activities by using virtual onscreen keyboard. Some iPad models also come with 3G wireless network adapter which can connect to 3G network and the Internet, but this is not the focus on this article and so will not be covered. 1) Tab Settings icon on iPad's home screen. 2) Tab on Wi-Fi icon to enter the iPad's wireless settings. 3) Ok. 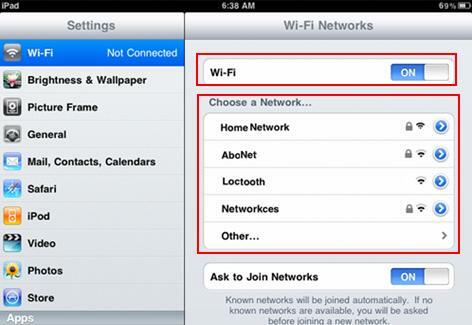 Here you need to make sure the Wi-Fi feature of iPad is ON. If not, slide the slider to turn it on. Select the wireless network you wish to connect under Choose a Network… section, and you will be prompted to key in wireless encryption key if that is secured wireless network (the one with padlock icon). Note: If your wireless network is not listed, probably it’s configured to not broadcast SSID. In this case, you can tab on Other… and manually join the network by entering the wireless network name (SSID) and encryption key as needed. 4) At last, wireless signal logo will appear on the top left of the iPad screen if it’s connected to wireless network successfully. That's it! You have done it! Return to top of "How to Connect iPad to Wireless Network"! !